Abstract: Starting from the optical glass production - clay pot melting, continuous tank melting, fine annealing, reheat pressing, quality assurance, we will the cover current glass types and future development of new optical glasses. We include our latest materials such as ZnS, chalcogenides and opto-ceramics and we will briefly discuss our latest development activities of novel laser glasses for bio-photonic, high-peak and high-average power applications. Finally a look into our closet - you might be surprised what's there. Biography: Angela Hohl-AbiChedid has a Ph.D. in Physics from Georgia Tech and an MBA from Babson College. She has held research and engineering positions at the Air Force Research Lab and Corning Lasertron and became R&D manager for the OSRAM SYLVANIA LED Systems group. 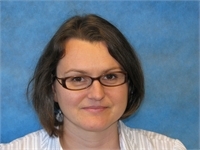 Recently she joined SCHOTT in PA as Business Development Manager. She is a member of SPIE and OSA.